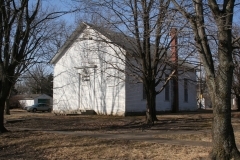 Constructed in 1878, the Denison Christian Church is a one-story building with a gable roof, clapboard siding, and a Doric surround entrance. Built by John Gardiner, William Austin Dodson and others, it was moved to its present location in 1889. It was nominated for its architecture. 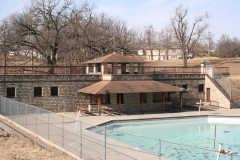 Located in Rafter's Park, the Holton Bath House and Swimming Pool was constructed in the mid-1930s as a Works Progress Administration project. The bath house and filter house reflect the Rustic-style architecture typical of New Deal-era recreational structures. Architect Charles Shaver of Salina and engineers Bob Pulette and Murray Wilson, who had designed dams and lakes for the Kansas Fish and Game Commission, drafted plans for the site. It sits in a low-lying area and was designed specifically for this site to enhance a natural drainage basin. The facility opened June 30, 1938, and the city band gave its first concert on the roof of the bath house. It was nominated as part of the "New Deal-Era Resources of Kansas" multiple property listing for is association with local recreation history. The McFadden Residence, constructed in 1949, is a one-story, side gabled Lustron home featuring the two-bedroom Westchester Deluxe Plan. The exterior porcelain and steel panels are dove gray with white trim. 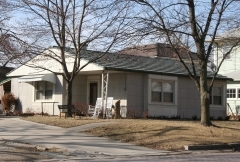 Built by Emery Construction of Topeka, for the William McFadden family, the Lustron was a prefabricated metal home that had interior features of built-in cabinets and bookshelves. It was nominated for its architecture and as one of only one hundred extant Lustron houses in Kansas. 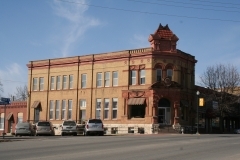 Constructed in 1906 to replace a previous building destroyed by fire, the State Bank of Holton is a two-story, tan brick building with a native stone foundation and red sandstone trim. Designed by Alfred Meier of St. Joseph, Missouri, it has motifs influenced by the Italian Mannerist Style. It is a late work of Meier, who also designed the W. W. Hetherington House in Atchison and the Old Logan County Courthouse in Russell Springs. The construction contract was awarded to G. W. Grote of St. Joseph with brick work being subcontracted to Mitchell and Frank, also of St. Joseph. It was nominated for its architecture and for its contribution to early 20th century community development. The Whiting Service Station was built in 1928 at the northeast corner of Whiting and 2nd streets at the south end of the community's small commercial district. Local mechanic Fred Thonen operated the Whiting Way Garage, a precursor to his Whiting Service Station, which opened May 5, 1928. 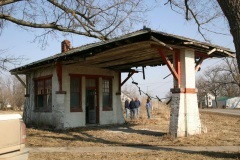 The station served the motoring public until it closed in 1966. It is an example of a domestic-style gas station, a type of station popular in the 1920s that resembled a small house that conveyed a sense of domesticity meant to appeal to auto travelers. 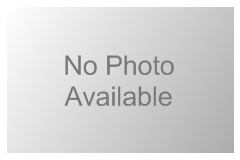 It exhibits the Craftsman style and features a canopy that extends over the driveway. The station was nominated for its local commercial and architectural significance.